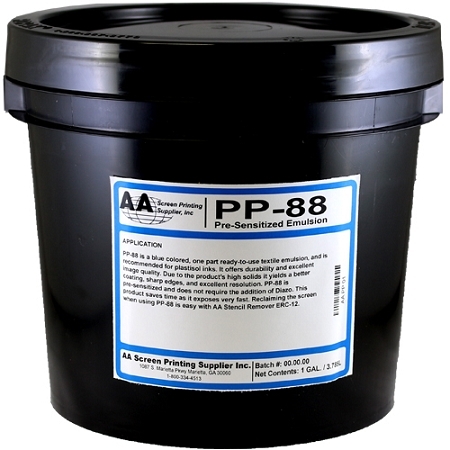 AAPP88B is a blue colored, one part ready-to-use textile emulsion, and is recommended for plastisol inks. It offers durability and excellent image quality. And the Water Proof inkjet film will not stick on the emulsion! 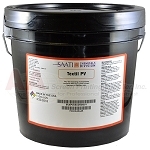 Due to the product’s high solids it yields a better coating, sharp edges, and excellent resolution. This Product is pre-sensitized and does not require the addition of Diazo. 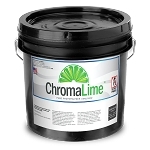 This product saves time as it exposes very fast. Reclaiming the screen when using AAPP88B is easy with AA ERC Stencil Removers, which are available in concentrate and ready-to-use formulas. • Offer Durability and Excellent Image quality. 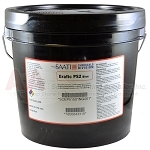 • high Solid Content, AA PP-88B provides a better coating, sharp edges, and excellent resolution. • Water Proof inkjet film will not stick on the emulsion.